You've heard of drinking whisky with ice, but how about with an ice pack? And on my nuts?!? Whaaaattt??? Yes, this may very well be the first post-vasectomy whisky review you've ever read. TMI, you say? Ah well, too bad. It's my review, I can write what I want. The doc told me to drink whisky today, anyway. Maybe. Here we have one of the most famous and well-known malts, the Laga 16. 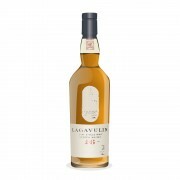 There is so much demand for this malt that it makes up the vast majority of Lagavulin's production, so much so that they can no longer supply any blends (not even Johnny Walker, their stablemate under Diageo). 100% of their distillate is bottled themselves as a single malt. This was one of the first "Classic Malts" when Diageo announced this range back in 1988. The colour is a deep amber. On the nose, an immediate tarry sootiness, with iodine, antiseptic, and lapsang souchong tea (my favourite!) Quite peaty, of course, but with a real richness. Bacon fat (no wonder you love it, Ron Swanson) But there is an odd vegetal off-note (cabbage?) in there I cannot place…which vanishes with a drop of water, to be replaced by more smoky tea. On the palate, dark fruits enveloped by smoky bonfires of peat - hotter in the mouth that I remembered. More bacon, Fisherman Friends, vanilla and mocha. Lots of oak - almost bourbon-like. That vegetal note is now gone, and this is absolutely wonderful. Water tames things a bit and smooths it over nicely. All I can say is.....ouch. I hope the peat in the lagavulin masks the pain. in order to enjoy the full range of flavours and notes you describe, would you recommend everyone undergo the same procedure first? @thecyclingyogi: he's abdolutely right. It's common knowledge that Laga 16 goes great with a vasectomy. Also you haven't LIVED until you've paired Ardbeg Corry with a colonoscopy! Lol... anyway, @talexander, thanks for another great review. Here's to a speedy and painless recovery! 5 years ago 2Who liked this? This review reminded me that my bottle was sitting in the back room, Lovely this evening with all the snow falling. Hope you get better soon. Great review. Of course, that would be more the masochist's route of choice, and not the option of 'whisky for consolation and healing'. Perhaps the new "Ron Burgundy" scotch would be appropriate for that! Ha ha ha! Yep, connosr is where I pick up my ladies, that's right! I always thought Lagavulin 16 was a pretty ballsy whisky. @talexander, by any chance do you remember what your source was on the following tidbit? "100% of their distillate is bottled themselves as a single malt." You sometimes see the oddball IB nowadays, so I'm just wondering whether things have changed or if that factoid was maybe only 99% true back in 2013. Cheers. @MadSingleMalt I don't remember what the source of that info was back in 2013, but I do remember later going to the Lagavulin distillery and the tour guide had said that as well. But you're right, it's not quite true - though they crop up very rarely, you do see the occasional IB of Laga. Before 2016, I probably would have wondered whether their few well-aged labels really could absorb every single cask, even the "off" ones. Today I wonder whether they're catching those early and just vatting them into the 8. 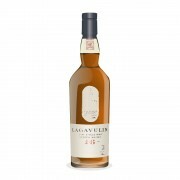 Lagavulin is still used in White Horse blended Scotch. One of my favourite Islays was "elements of Islay" LG2, which I believe I was given the privilege to taste by the author of this review. Gosh. Been years since I checked in. Nice to see some familiar faces still at it! Had Laga 16 yesterday. Nothing technical to contribute but still loving it! Cheers fellas! @hunggar, are you still drinking whisky, and still in Taiwan? @hunggar, A blast from the past! Welcome Back! Do check-in now and again. There are some great 'home and native' whiskies recently released. @Victor, these days I tend to bounce between Taipei and Shanghai, but yes, still at it, albeit a bit too busy to contribute to the online forums. @paddockjudge, I still try to get home every year or two, but sadly I know very little about the homegrown stock. My fondest memory of Canadian whisky remains the Red Letter I picked up a few years back. Keen to see what's new when I visit next year! @hunggar, the stuff @paddockjudge is talking about will be sold out in the next few weeks. NBC = Northern Border Collection. There is already a long Connosr discussion on the subject. @Nozinan A couple of years ago, I actually contributed to an article in Today's Parent about getting a vasectomy!